Wearable fitness tech – game changer? As we discussed in our last blog post, people are being encouraged to abandon the confines of the gym and do more exercise outdoors. This is all well and good, especially as we move towards the better summer weather, but using equipment at the gym does has its advantages. One of the things I miss when I’m running outside rather than on a treadmill is the little data dashboard telling me how far I’ve run, how long I’ve been running for, and my burned calories. I also quite like the heart rate monitor as it shows the exercise I’m doing is actually having an impact. Not only does the data serve as a way of showing how my fitness is improving, but it also keeps me motivated to improve. Do you agree? Unsurprisingly, coupled with the trend towards more outdoor exercise, is the rise in wearable tech. The rise in wearable tech was one of our fitness industry predictions for this year, and so far 2015 has proved us right. Here’s the lowdown on the more popular models. Anyone with an iPhone or iPad must be aware of the Apple Watch. Apple’s latest product is designed to do a range of stuff, including sending you notifications of emails and all sorts of other iOS staples. It can also sync with the Apple Watch app which seems to have mysteriously appeared on my iPhone5 during one of the recent upgrades. Apple Watch syncs with your iPhone (version 5 and above), and can do lots of things, including monitoring your activity levels and counting your calories. It also has an in-built heart rate sensor. A competitor to Apple Watch is the Microsoft Band, which encourages you to leave your phone in your pocket and miss none of the special moments in your life. It is certainly not as pretty as the Apple Watch, but it’s a huge saving and has lots of great features. It has in-built GPS, heart rate monitor, and sleep tracking. You can also preview your emails as they come in. If you have a Windows phone, you can access Cortana (the Microsoft equivalent to Apple’s Siri), although the Microsoft Band is designed to work with whatever phone you own, whether this is Android, Windows, or iOS. 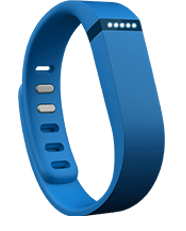 Fitbit Flex ™ comes in a range of colours and is a very simple style. There’s not much to look at while on the go, but it’s a lot more discreet and syncs with your device for later perusal. You can set goals using the free app, which tells the Fitbit Flex to keep you on track with lights and vibrations. We don’t think that no one model has cracked the market yet. The fitness-specialist devices aren’t very good for doing other things like checking emails, whereas the all-round devices such as Apple Watch could do the fitness side of things much better. We are probably a few years away yet from more comprehensive offerings. However, wearable fitness tech can pose a real threat to indoor gyms. With a relatively small investment and smart use of your existing devices, you can have your own personal trainer literally to hand 24/7. The challenge to traditional fitness companies is to find a way of incorporating this new tech into their activities – maybe syncing them with their own machines, or creating their own online communities, or finding a way of sending the data to a real Personal Trainer who can use them as a supplement to paid PT sessions. Wearable tech can’t badger you into exercising, or shout at you if you’re slacking, or provide a friendly ear when you’re really not feeling it. In reality, wrist bands with flashing lights are no substitute for human interaction and knowledge, though us humans better be careful, because wearable tech is developing fast and it won’t be long before those pesky machines are after our jobs.